As well as looking at art from our modern age, I also try to introduce children to folk art and tribal art from around the world, as well as the imagery created by ancient civilisations and prehistoric man. 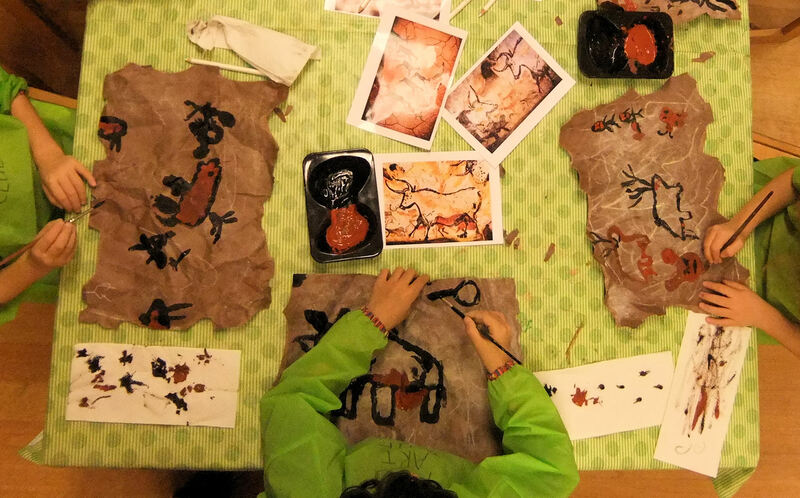 It is fascinating for children to imagine what it must have been like to live hundreds or thousands of years ago, and the art of the past gives us an insight into that world. 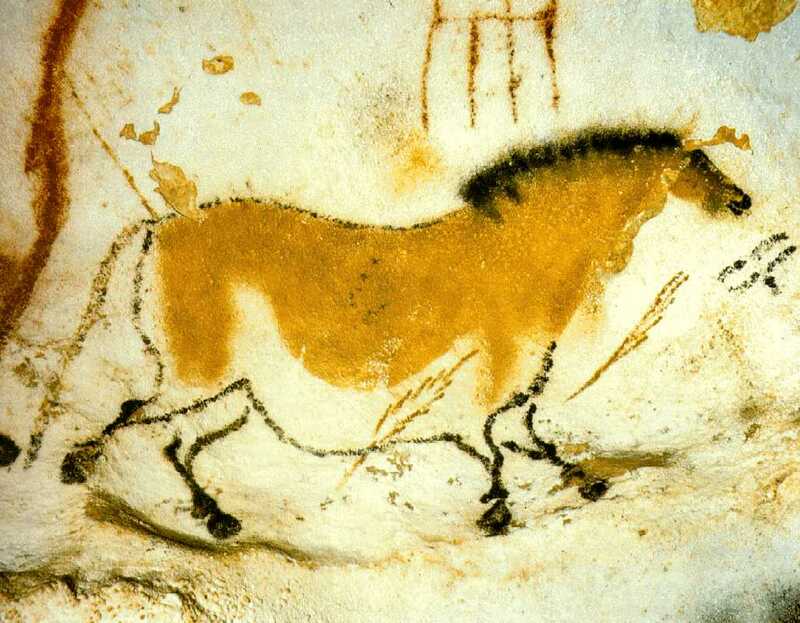 The amazing cave paintings at Lascaux in south-west France are estimated to be 17,300 years old. They were discovered in 1940 by a group of teenage boys and their dog as they explored the woods of Montignac for a fabled tunnel containing hidden treasure! 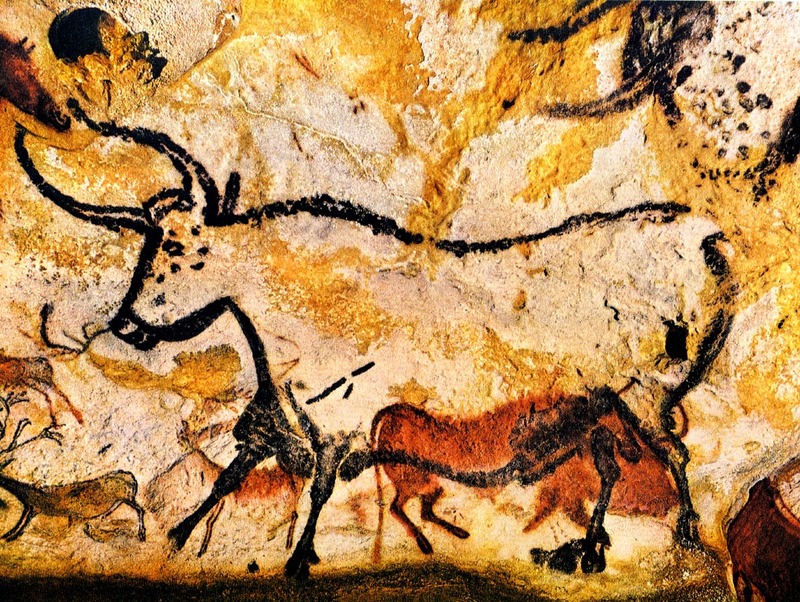 What the boys found was treasure indeed – a “cavalcade of animals larger than life painted on the walls and ceiling of the cave; each animal seemed to be moving” in the words of fourteen year ‘discoverer’, Jacques Marsal. 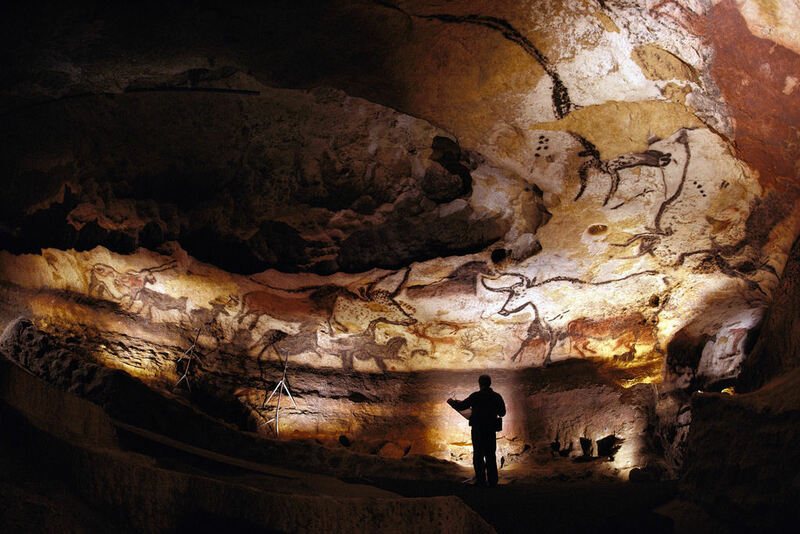 More than 900 animals are painted or incised into the rocks, mostly cattle, deer and horses, hunted by human figures with bows and arrows. Four huge bulls dominate one chamber, known as the The Great Hall of the Bulls, the largest bull measuring an incredible 5.2m (17 feet) from nose to tail. 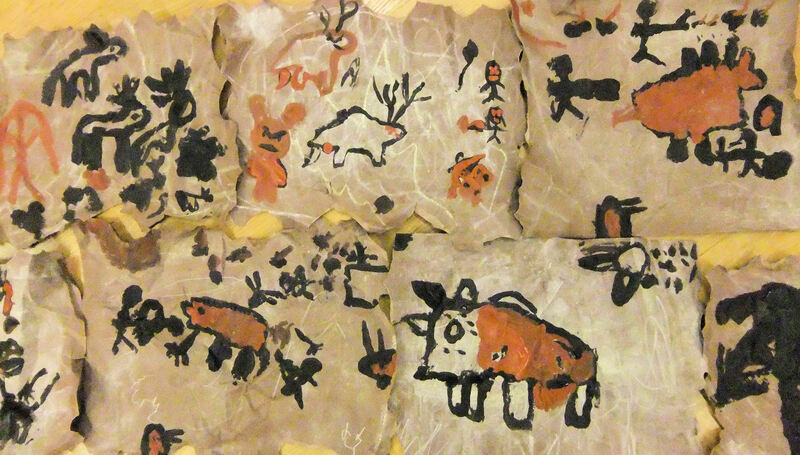 I wanted my 4-6 year olds to experience something of what it would be like to paint onto a rough, cracked and uneven cave wall, so everyone set about ‘distressing’ a sheet of brown paper! 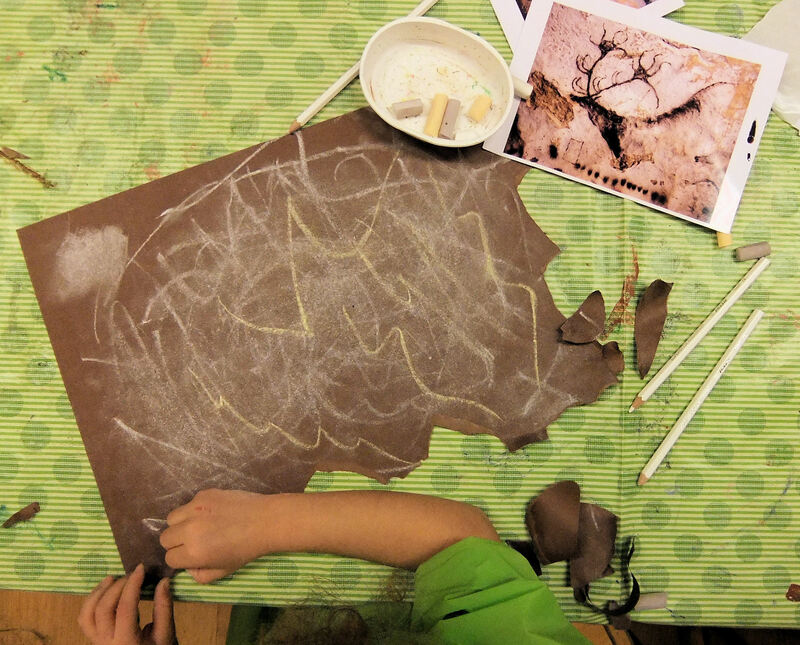 Starting with white pencil, the kids added cracks by drawing jagged lines. Then they got to work with chalks (white, brown and yellow), creating patches of colour which they rubbed into the paper with their fingers. As well as adding colour, the chalks also gave a dusty effect like mildew or crumbling rock. To make the paper look like a fragment of rock, they tore rough edges and then screwed it up into a tiny ball! When it was carefully opened out, the paper was left with a heavily textured surface, pitted with creases and crevices. 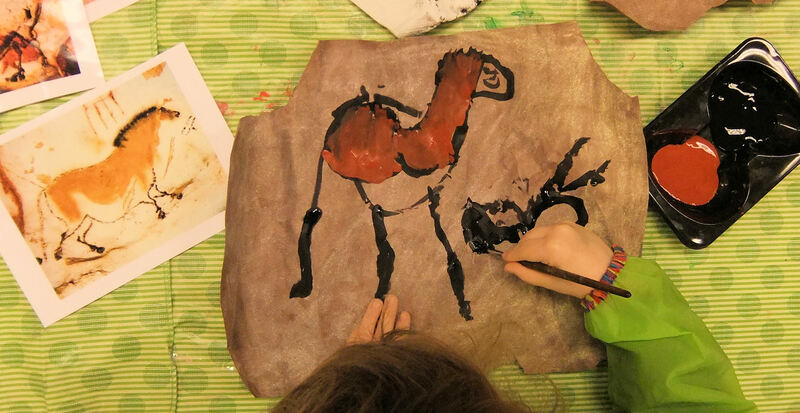 Next, the children looked closely at photographs of the Lascaux caves, before painting their own animals and human figures, using a fine brush to draw the outlines in black and reddish-brown paint, similar to the mineral pigments used at Lascaux. 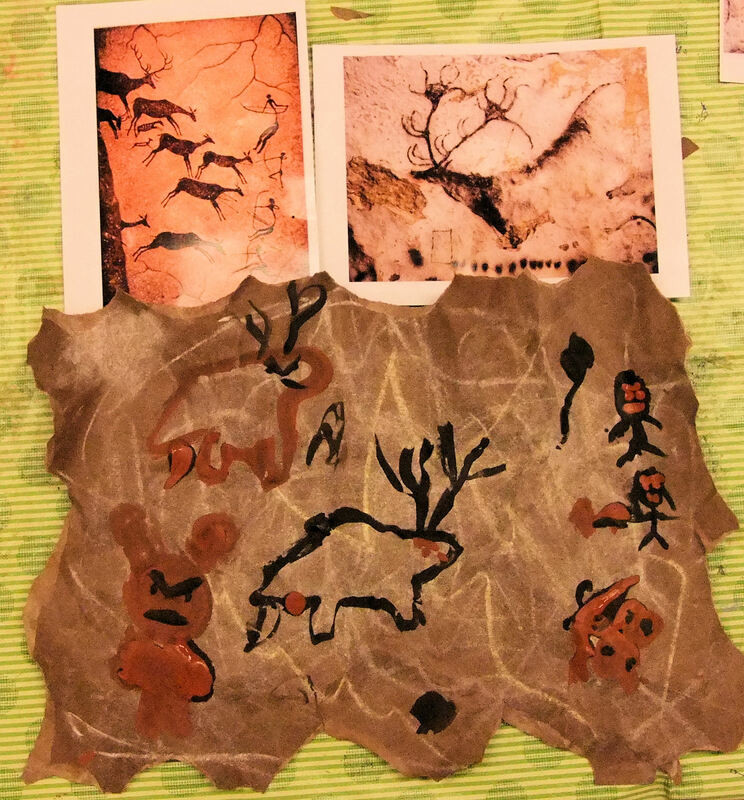 Some of the kids faithfully copied the animals in the photographs, trying to reproduce a section of the cave wall, while others used their imagination to add some unexpected creatures, such as butterflies! Trying to delineate their animals on the crinkled, dusty paper surface was much more challenging than painting on smooth, flat paper, and it was a great lesson in how to paint with a lighter touch, using just the very end of the bristles! 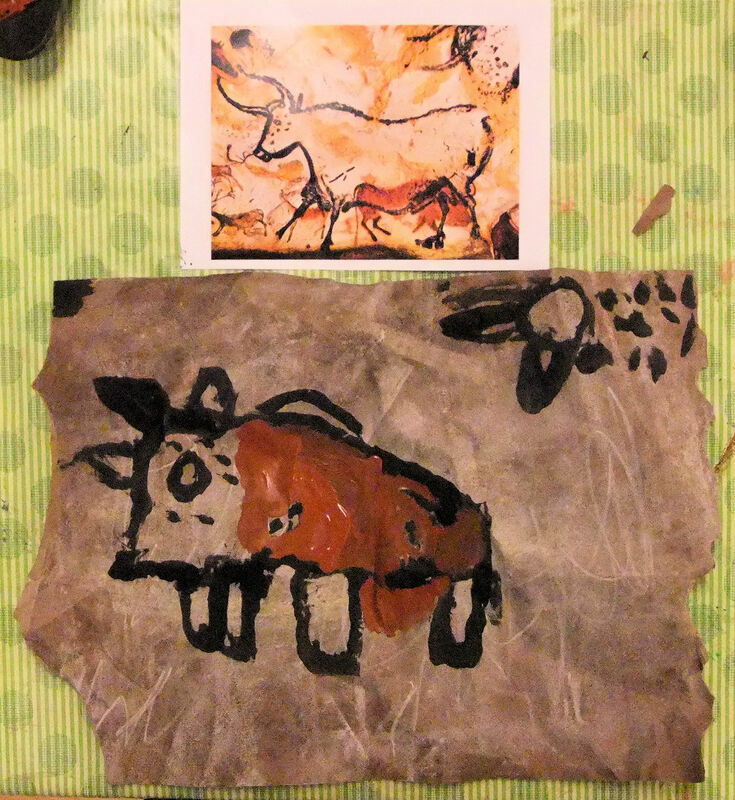 Art Club really enjoyed learning how to paint like a cave man! We did this as a preschool class, even making our own paint from berries mixed with glue and red dirt from Arizona also mixed with glue. We used one large sheet of butcher paper and when we were done, we put balled up newspaper behind it to make it look like a cave wall, sticking out. It’s hanging at the school on a wall and looks like a real cave wall.